H: 19.5cm (8 inches) L: 23cm (9 inches). 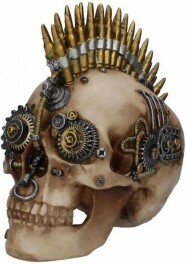 Ornamental skull in a steampunk design with a double row bullet mohican. Made from a quality resin for a solid bone effect, excellent detail. Base dimensions: 15 x 8 cm. Height: 19.5cm (8 inches) L: 23cm (9 inches).